Do you love pretzels? Do you have a favorite pretzel brand and can tell the difference between brands with your eyes closed? 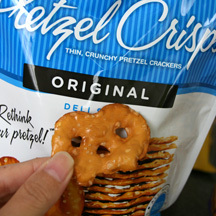 Did you know that you can enjoy the great pretzel flavor in a cool crispy wafer if you try Pretzel Crisps? The world’s first spreadable pretzel cracker, Snack Factory’s Pretzel Crisps are exceptionally thin, fl at-baked pretzels baked without any trans fats, saturated fat, or cholesterol. Only 110 calories per serving, their original Deli line features flavors such as Everything, Garlic and Parmesan, and a new Sesame. The Deli line is sold exclusively in supermarket deli sections and nowhere near the high-calorie, low-nutrition chips that populate traditional snack food aisles. 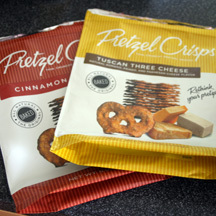 With distribution all across the country and a staggering 70,000 fans registered on the www.pretzelcrisps.com site, it’s clear the Wilsons have another winner in the bag. I had a serious problem when the samples of Pretzel Crisps arrived at my door. With 9 (soon to be 13) flavors to choose from, I didn’t know where to begin. From Original to Everything, Pretzel Crisp is expanding the taste of just the pretzel to include sesame, cinnamon, and other great flavors. So if you’re unsure with where to begin, the best place to start is with what you know. I started with the Pretzel Crisps Original flavor. When you open up the bag and pull out the first Crisp, you’ll probably think “woah…who sat on my pretzel?” The Pretzel Crisp has the great golden color and salt as other pretzels, but it’s thinner and flatter, like it went through a press before baking. Since the pretzel is thinner, it bakes up a lot crispier and when you bite into it, little flakes of pretzel go flying through the air if you aren’t careful. 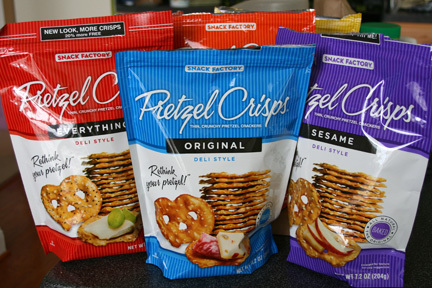 All that being said, the name “Pretzel Crisps” really makes sense. They are pretzels that are crispy. Once I ate the first bag – which didn’t take long – I turned around to try some of the other flavors only to discover that some of the other testers had already beaten me to them. The Garlic and Parmesan? I was lucky to get a bite. I know why it went so fast too – the garlic and Parmesan flavors worked beautifully with the pretzel without overwhelming the pretzel flavor that I love. I had to steal a pile and hide it in a napkin to ensure that I’d be able to eat more. I didn’t even get a chance to taste the Cinnamon Toast or the Tuscan Three Cheese since they were eaten so quickly, although I hear that the Cinnamon Toast tasted just like cinnamon toast you have for breakfast and the Tuscan Three Cheese was really savory and deliciously cheesy. If you love pretzels but want the crunch of a chip, then Pretzel Crisps are the way to go. Full of flavor and perfectly crispy, you’ll be sure to find your favorite flavor easily. They’ re great for snacking on (clearly) and will be sure to please snackers of all ages.